If you’re anything like most people, then you will know the 4pm slump like the back of your hand. Marking the time between lunch and dinner, 4pm is a time in which we can feel at our lowest point and to counteract a dip in our energy levels, we can often make bad snacking choices. If you’re trying to follow a healthier diet, then mid-afternoon snacking might seem like it’s off limits but in fact, you might just be looking for your energy boost in the wrong place. The healthy snacking box can keep your hunger levels at bay while giving you a nutritional kick, making getting back to work easier than ever. Delicious and functional? What’s better than that? 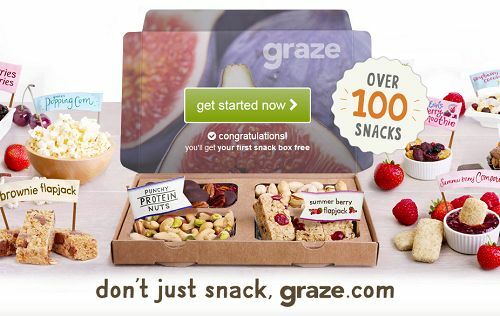 One of the best snack box subscriptions out there, Graze comes packed with all of the healthy options you have ever dreamed of, presented in incredibly delicious forms. As well as being good for your body, the snacks come packaged in recycled materials, sourced from sustainable rainforests. Delivered either every 2 weeks or once a month, the boxes will keep you topped up in snacks and won’t leave you feeling guilty afterwards. Get your first box free!